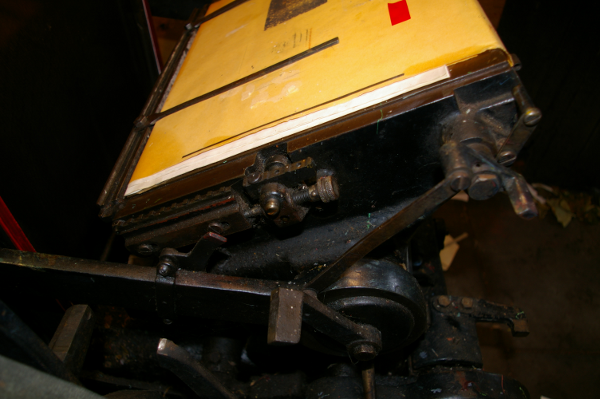 Paekakariki Press was established in 2010 to continue the tradition of letterpress printing that is in danger of disappearing in the digital age. 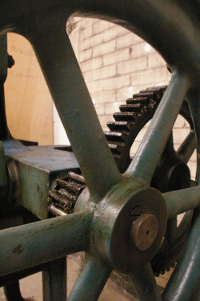 The project started with the acquisition of a Furnival Guillotine from the 1880s and somehow has developed into a full-blown letterpress workshop in Walthamstow, London, with some 300 cases of type, a Heidelberg KS cylinder, a Ludlow typograph, a Thompson British Automatic platen, a Victoria Art platen and most recently, a Monotype Composition Caster and a Super Caster. Letterpress is the name of a printing process by which a raised surface is inked and then pressed against paper or other material. The machine that prints in this way is called a Press. Just as we don’t have a machine called a Lithography or a Photography we also don’t have a Letterpress. Having started with the idea of printing letterpress, we needed something to print and bit by bit found ourselves to be publishers of poetry.
. It is unlikely that we will be able to accept submissions from outside the UK (or New Zealand) as the economics of the project are fairly tightly tuned. Submissions on paper are also liable to get submerged under piles of other paper or mislaid and in any case will have to be scanned for further processing which can introduce errors. Current publications are available here and those in the pipeline are listed here. The Heidelberg KS Cylinder 380 x 520 acquired from Prespac, Coventry. This 2.6 tonne beast was installed into its specially cleared space in September 2010 just in time for the second weekend of the E17 Arts Trail. Whilst it is not as antiquated as the rest of our equipment, it was still made before 1960! 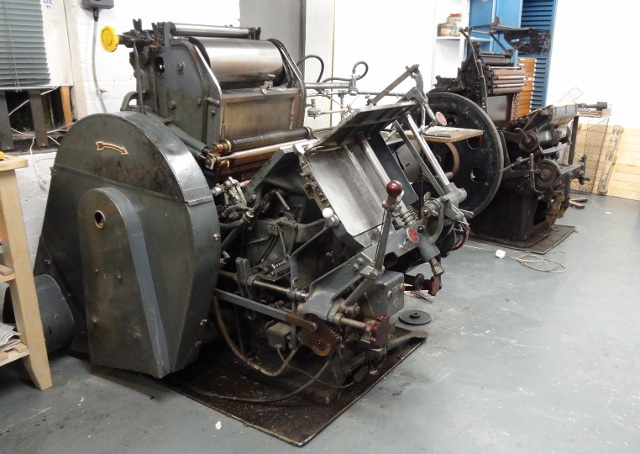 Now after a visit from some Heidelberg engineers it has been levelled and runs very smoothly. The Furnival Guillotine in our workshop. It has been thoroughly cleaned oiled and greased and the mechanism slides beautifully. It has been treated to a new wooden handle turned by our neighbours Nichols Bros (Wood Turners) Ltd. Unfortunately over the last 100 years, the blade had been sharpened so much such that it didn’t quite hit the cutting stick any more, so we had Mastercut Cutting Systems Ltd make us two shiny new (and sharp) blades—no more need for mill board under the blade! We debated whether to get a Heidelberg platen, but just couldn’t bear the thought of being whacked on the head by the delivery arm, so settled for a Thompson—the best auto platen in the world—according to their advertising leaflet. Thompson-British Automatic Platen with Auto Vic in the background. The tail lift of the truck used to transport our two AutoVic art platen machines is now repaired, and now the finest of them has made it to the workshop thanks to Mike Kirby of Linecasting Machinery Ltd. The original rollers were in a rather poor state with most of the composition dripping down the wall of the garage we found the press in but we’ve had the rollers re-covered by Böttcher UK and all is now well. Also in the collection is a Model Printing Press Co. No 3 Treadle Platen. It came with only one roller stock, so we had another one made by our lathe-owning friend. 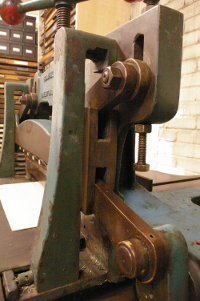 With the press was a brass roller mould, but so far the experiments in roller composition mixtures have resembled those that drip down the walls in old printing shops. In the end we sent the rollers off to Böttcher UK. They’re now a lovely soft squidgy rubber. The roller runners run on a couple of strips of leather which had stretched and thinned over the years and needed packing to get the rollers to the right height over the forme. They’ve now been replaced, but the thickness is still not quite right and they still need to packed out. The rollers are the correct diameter as we have the original roller mould! Our Ludlow Caster is nestling in our back room which is supposed to be the bindery and paper handling area, but at the moment seems to be the repository for anything that doesn’t fit in the main room. It was a job to get it up the 45 degree ramp but we managed eventually. Even after the pot has been simmering for a while, it’s still cold in the back room. We now have a Monotype Composition caster and a Super caster, which we have successfully used to cast the 12pt Garamond for our latest publication. John Southward (1840-1902), was a writer on typography and author of a number of standard texts on printing in the latter part of the nineteenth century. In his introduction to Gould’s Letter-Press Printer he expresses his enthusiasm at the progress in the art of printing and would doubtless have been excited at how things have changed 100 years later. Such is a rapid review of the progress of typography during the past four hundred years. Perhaps no industrial art has received such a development; yet it must not be concluded that invention has exhausted itself. To the art of printing Thus far shalt thou go and no further, cannot possibly be said. There is no limit to the improvement of which even yet it is capable ; the products of the present will inevitably be eclipsed by the products of the future, just as the achievements of the past have been outshone by those of the present. John Southward’s Practical Printing is an excellent text on the art of letterpress printing and many modern letterpress printers would benefit from its study. Michael Shann's new collection of poems: Euphrasy has finally been bound and is ready to ship! Michael Shann has been writing poetry for over fifteen years. His poems have appeared in a wide range of poetry magazines and anthologies. Michael has also completed a novel, The Protesters, which draws on his experience of living and working in China. Click here to buy your copy now! After a little trip to Mike Kirby of Linecasting Machinery, we acquired some more Ludlow Mats and can offer to cast suitable slugs for others to use in Hot Foil applications (or even printing!) The list of founts available from us or the Elrod Press is here.